Alastair Seeley marked his return to the EHA Racing Yamaha team by winning the first British Supersport race of the weekend at Silverstone on Saturday. Seeley held off championship contenders Jack Kennedy and Ben Currie to take victory on the final lap. Josh Elliott won part one of the 1000cc Superstock race before finishing second behind Alex Olsen in part two. Glenn Irwin was second in the Superbike race won by Leon Haslam and lies third overall in the championship standings. Carrickfergus man Irwin, Jake Dixon, Taylor Mackenzie and Josh Brookes all enjoyed spells at the front but Kawasaki rider Haslam pounced with just a few corners to go. Be Wiser Ducati pilot Irwin had hit the front at Brooklands six laps from the end but left the door open for Haslam to steal the win by 0.171 seconds, with Mackenzie securing the final rostrum spot by 0.043 seconds from team-mate Brookes. Dixon was fifth and lies second in the series on 241 points, 114 behind Haslam, with Irwin third on 207. Andrew Irwin came home 11th and Toomebridge's Michael Laverty was 14th on the Tyco BMW, with two more Superbike races on Sunday to finalise the leading six riders who will compete in the Showdown for the title over the final three rounds. "It's been a bit of a scrappy weekend with the weather, but I felt pretty comfortable in the race and although second's a good result, I obviously want to win," said Glenn Irwin. "We'd all used most of our tyres by the end of the race and although I didn't miss a gear going onto the straight on the last lap, it wasn't the cleanest of shifts and that gave Leon his chance. I didn't brake maybe as late as I could have done but I didn't want to lose the podium either, so we'll take second place today. "I was only a fraction off the win again so hopefully we'll get one soon and the main thing was qualifying for the Showdown." OMG Racing Suzuki rider Elliott, from Fermanagh, took the chequered flag in part one of the 48-lap Superstock affair, before Olsen bagged a first ever win in the class. Clogher's Tyco BMW rider Keith Farmer was third in part one and is tied for second in the championship on 197.5 points, with leader Australian Billy McConnell on 201. Elliott moves ahead of Lee Jackson into fourth, 50 points further back. 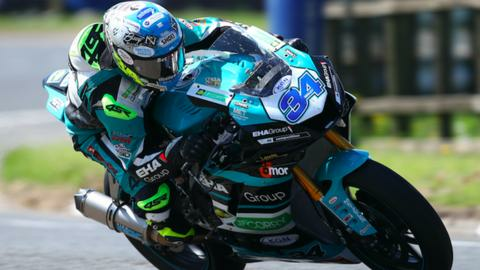 Seeley, who was back in the colours of EHA Racing with whom he won at the North West 200 this year, was involved in a race-long battle at the head of affairs and won by less than a tenth of a second after squeezing through at Brooklands on the final circuit. Dubliner Kennedy was 0.062 seconds behind in the runner-up position, with Currie third.